Foam insulation combined with a vapor barrier provides superior insulating performance. Most crawl spaces are insulated with the wrong type of insulation. Whether you have soggy fiberglass insulation hanging from the joists or no insulation at all, Ohio Basement Systems has the solution. By conditioning the crawl space, we can help reduce mold and dust mite, energy loss from air ducts, and drafts, and make first-level floors warmer in the winter. Contact Ohio Basement Systems for a free consultation and cost estimate on crawl space insulation and encapsulation services in Greater Cleveland. We'll get rid of wet crawl space insulation and make sure your below-grade space stays dry with the proper insulating solutions. There are different types of insulation, and each type will work well in some applications and poorly in others. Builders began using fiberglass batts to insulate crawl spaces many years ago, before newer types of insulation had been developed. Today, we know that fiberglass performs poorly when installed between crawl space joists. In fact, if often ends up as a moisture-soaked mess on the crawl space floor. 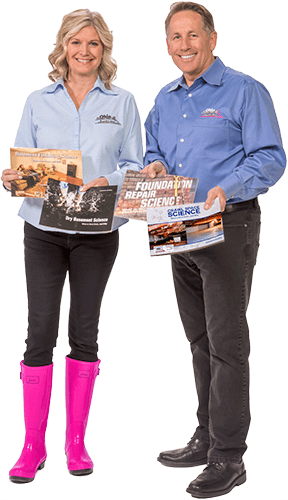 Home performance experts recommend that crawl spaces be encapsulated (sealed) and insulated to help prevent mold and moisture problems, and to make the home more comfortable and more energy efficient. 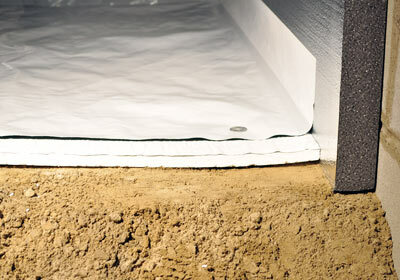 The best time to upgrade crawl space insulation is during the encapsulation process. Unlike fiberglass insulation, the crawl space insulation that Ohio Basement Systems installs won’t absorb moisture, fall out of place, or lose its R-value. It's important to seal and insulate the rim joist and sill. Walls. 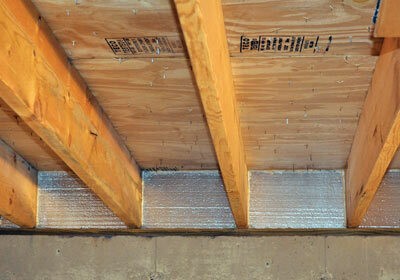 SilverGlo® rigid foam insulation is the perfect choice for insulating crawl space walls. This upgrade moves your home’s thermal boundary to the foundation walls, which makes your home more comfortable and your HVAC system more efficient. Floor. If you live in an area where the ground freezes during wintertime, TerraBlock™ crawl space floor insulation is a smart upgrade to install. It can be installed over a dirt or concrete floor. TerraBlock™ is high-performance crawl space insulation that includes a durable moisture barrier. The ¾-in.-thick sheet material can be installed directly over any type of crawl space floor, providing a clean, dry surface that helps the home to be more comfortable and energy efficient. Thanks to its puncture-proof design, TerraBlock™ also provides a cushioned surface for anyone who needs to work in your crawl space. To provide drainage in a crawl space that has water seepage, we install TerraBlock™ over drainage matting that directs water to a sump pump. TerraBlock™ can also be used to seal and insulate crawl space walls. It’s compatible with other products in the CleanSpace® system. SilverGlo® rigid foam insulation is available exclusively from Basement Systems. Thanks to a patented graphite infusion process, SilverGlo™ has higher R-value than standard EPS foam (R-11 for a 2-in.-thick panel). Every SilverGlo™ panel also comes with a shiny integral radiant barrier that reflects heat for enhanced energy efficiency. SilverGlo™ is ideal for insulating basement and crawl space walls because of its excellent thermal properties and exceptional durability. It won’t lose R-value or be damaged by moisture. Don’t settle for messy, inadequate fiberglass insulation in your crawl space. Let the experts at Ohio Basement Systems install the right insulation in the right location, so you never have to worry about crawl space insulation again. We also offer a variety of other crawl space repair solutions to give you a dry, healthy crawl space. If you live in Cleveland, Akron, Strongsville or the surrounding area, contact us today to schedule an on-site evaluation and free cost estimate.